Gal in the Middle: Our State Fair is a Great State Fair...Ticket Giveaway! Our State Fair is a Great State Fair...Ticket Giveaway! Are you ready for some State Fair fun??? My first memory of heading to the Indiana State Fair is when I was about 8 years old and I've been ALMOST every year since then - minus a couple of years that I was living out of state in my early 20's. Over the next few days I'll be sharing some of my favorite parts of the Indiana State Fair, but now I want to share some exciting news. 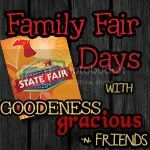 Some GOODe friends and I are getting ready for Family Fair Days with GOODEness Gracious 'N Friends at the Indiana State Fair! We will be visiting the State Fair - courtesy of Indiana Soybean Alliance - and giving you some behind the scenes looks at awesome State Fair activities! To kick things off right today, the Indiana Soybean Alliance has given me and all of my friends 4 Indiana State Fair tickets each to giveaway on our blogs to our readers! • Winner of 4 Indiana State Fair Tickets courtesy of the Indiana Soybean Alliance will be chosen at random on August 10. • Each person is eligible for 2 entries: 1 entry for following this blog and 1 entry for commenting. • Please leave a separate comment below for each entry. (If you are already a blog follower or Facebook fan, please just post a separate comment sayin' so. • Hop on over to all of the following blogs for multiple chances to win! I would love to win some State Fair tickets. I became a follower. Thanks for the chance! I'm a blog follower! Thanks for the giveaway! Looking to take my kids to the fair this year. Love to win those tickets!